Pikes Peak Aikido is the oldest continually operating aikido dojo in the Pikes Peak region. We have been a part of the Colorado Springs martial arts community since the mid-1980s. We are affiliated with the Aikido World Headquarters as a member of Aikido Shimbokukai, but we do not focus on a particular aikido style or lineage. We are a community of practitioners dedicated to individual refinement and growth through aikido training. 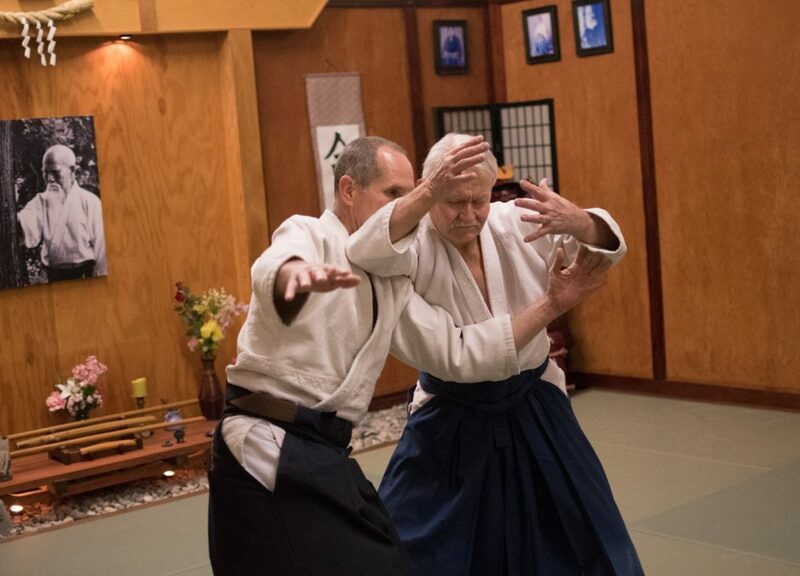 We benefit from having instructors and students from a wide variety of backgrounds in aikido and other martial arts. The curriculum includes work with aiki-ken (wooden sword) and aiki-jo (short staff). We are located at 3425 Van Teylingen Drive, in Colorado Springs. The entrance is around the back side of the building, across from King Pin Lanes. The dojo opens 20 to 30 minutes before the scheduled practice time. Pikes Peak Aikido welcomes visitors and observers during any practice. If you would like to try aikido training, beginners are welcome to participate at any time. Just come to the dojo in loose-fitting athletic clothing fifteen minutes before practice begins. Beginners may attend several classes before deciding whether to join. Our practices are inclusive and accommodating to anyone’s level of experience or physical limitations. The daily mat fee for visitors $10. Members pay dues month to month. Pikes Peak Aikido is a nonprofit dojo run cooperatively by its members. All fees and dues go toward dojo expenses and maintenance.